White Paper Abstract: As ACA reforms continue to impact the healthcare industry, population health management (PHM) is fast becoming the new buzzword for the management, integration and measurement of all health programs offered by an organization a set of interventions aimed across the health continuum. 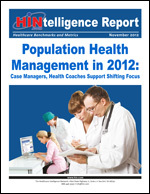 New market research from the Healthcare Intelligence Network has determined that the key to this movement is the focus on the whole population, with 83 percent of respondents to HIN's Population Health Management Survey citing the use of a population approach versus disease management (75 percent). Download this HINtelligence report to learn more about PHM and the programs being offered by 102 healthcare companies, including who's part of the PHM team, program components and delivery, populations served, most successful strategies, results and ROI.